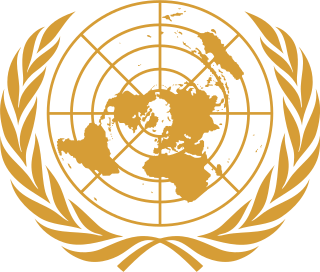 Produced by the World Health Organization, it is used in several countries around the world. Some have gone on to develop their own national enhancements, building off the international classification. Chapter I of ICD-10 deals with certain infections and parasitic diseases. Infections specific to a body system are found in other chapters, for example cellulitis is found in Chapter XII. Typhoid fever, also known simply as typhoid, is a bacterial infection due to Salmonella typhi that causes symptoms. Symptoms may vary from mild to severe and usually begin six to thirty days after exposure. Often there is a gradual onset of a high fever over several days; weakness, abdominal pain, constipation, headaches, and mild vomiting also commonly occur. Some people develop a skin rash with rose colored spots. In severe cases there may be confusion. Without treatment, symptoms may last weeks or months. Diarrhea is uncommon. 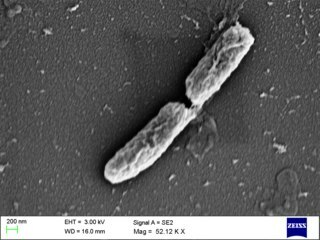 Other people may carry the bacterium without being affected; however, they are still able to spread the disease to others. Typhoid fever is a type of enteric fever, along with paratyphoid fever. Paratyphoid fever, also known simply as paratyphoid, is a bacterial infection caused by one of the three types of Salmonella enterica. Symptoms usually begin 6–30 days after exposure and are the same as those of typhoid fever. Often, a gradual onset of a high fever occurs over several days. Weakness, loss of appetite, and headaches also commonly occur. Some people develop a skin rash with rose-colored spots. Without treatment, symptoms may last weeks or months. 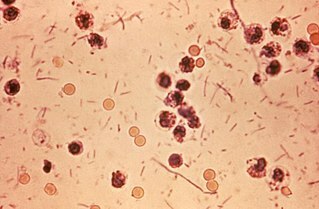 Other people may carry the bacteria without being affected; however, they are still able to spread the disease to others. 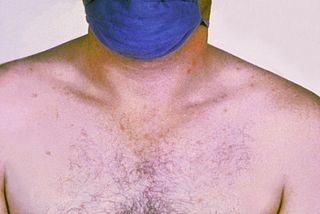 Both typhoid and paratyphoid are of similar severity. Paratyphoid and typhoid fever are types of enteric fever. Encephalitis is inflammation of the brain. Severity is variable. Symptoms may include headache, fever, confusion, a stiff neck, and vomiting. Complications may include seizures, hallucinations, trouble speaking, memory problems, and problems with hearing. Flaviviridae is a family of viruses. Humans and other mammals serve as natural hosts. They are primarily spread through arthropod vectors. The family gets its name from the yellow fever virus, the type virus of Flaviviridae; flavus is Latin for "yellow", and Yellow fever in turn was named because of its propensity to cause jaundice in victims. There are currently over 100 species in this family, divided among four genera. Diseases associated with this family include: hepatitis (hepaciviruses), hemorrhagic syndromes, fatal mucosal disease (pestiviruses), hemorrhagic fever, encephalitis, and the birth defect microcephaly (flaviviruses). Myelitis is inflammation of the spinal cord which can disrupt the normal responses from the brain to the rest of the body, and from the rest of the body to the brain. Inflammation in the spinal cord, can cause the myelin and axon to be damaged resulting in symptoms such as paralysis and sensory loss. Myelitis is classified to several categories depending on the area or the cause of the lesion; however, any inflammatory attack on the spinal cord is often referred to as transverse myelitis. 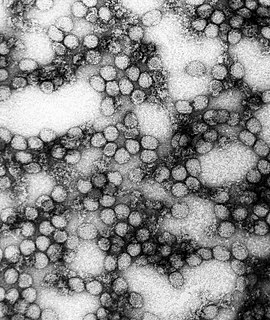 Flavivirus is a genus of viruses in the family Flaviviridae. This genus includes the West Nile virus, dengue virus, tick-borne encephalitis virus, yellow fever virus, Zika virus and several other viruses which may cause encephalitis, as well as insect-specific flaviviruses (ISFs) such as cell fusing agent virus (CFAV), Palm Creek virus (PCV), and Parramatta River virus (PaRV). Arbovirus is an informal name used to refer to any viruses that are transmitted by arthropod vectors. The word arbovirus is an acronym. The word tibovirus is sometimes used to more specifically describe viruses transmitted by ticks, a superorder within the arthropods. Arboviruses can affect both animals, including humans, and plants. In humans, symptoms of arbovirus infection generally occur 3–15 days after exposure to the virus and last three or four days. The most common clinical features of infection are fever, headache, and malaise, but encephalitis and hemorrhagic fever may also occur. Tick-borne encephalitis (TBE) is a viral infectious disease involving the central nervous system. 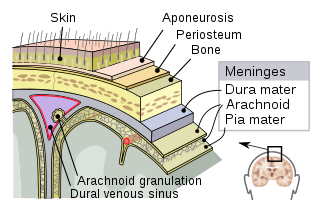 The disease most often manifests as meningitis, encephalitis, or meningoencephalitis. Long-lasting or permanent neuropsychiatric consequences are observed in 10 to 20% of infected patients. Viral encephalitis is a type of encephalitis caused by a virus. An emerging infectious disease (EID) is an infectious disease whose incidence has increased in the past 20 years and could increase in the near future. Emerging infections account for at least 12% of all human pathogens. EIDs are caused by newly identified species or strains that may have evolved from a known infection or spread to a new population or to an area undergoing ecologic transformation, or be reemerging infections, like drug resistant tuberculosis. Nosocomial (hospital-acquired) infections, such as methicillin-resistant Staphylococcus aureus are emerging in hospitals, and extremely problematic in that they are resistant to many antibiotics. Of growing concern are adverse synergistic interactions between emerging diseases and other infectious and non-infectious conditions leading to the development of novel syndemics. Many emerging diseases are zoonotic - an animal reservoir incubates the organism, with only occasional transmission into human populations. Powassan encephalitis, caused by the Powassan virus (POWV), a flavivirus also known as the deer tick virus, is a form of arbovirus infection that results from tick bites. It can occur as a co-infection with Lyme disease since both are transmitted to humans by the same species of tick. There has been a surge in the number of cases and geographic range in the last decade. In the United States, cases have been recorded in the northeast. 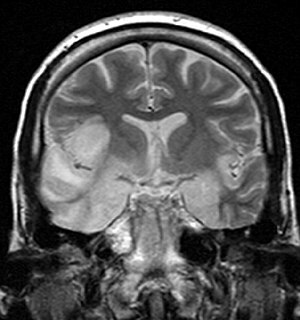 The disease was first isolated from the brain of a boy who died of encephalitis in Powassan, Ontario, in 1958. The disease is a zoonosis, an animal disease, usually found in rodents and ticks, with spillover transmission to humans. The virus is antigenically related to the Far Eastern tick-borne encephalitis viruses. The Central Nervous System controls most of the functions of the body and mind. It comprises the brain, spinal cord and the nerve fibers that branch off to all parts of the body. The Central Nervous System viral diseases are caused by viruses that attack the CNS. Existing and emerging viral CNS infections are major sources of human morbidity and mortality. Virus infections usually begin in the peripheral tissues, and can invade the mammalian system by spreading into the peripheral nervous system and more rarely the CNS. CNS is protected by effective immune responses and multi-layer barriers, but some viruses enter with high-efficiency through the bloodstream and some by directly infecting the nerves that innervate the tissues. Most viruses that enter can be opportunistic and accidental pathogens, but some like herpes viruses and rabies virus have evolved in time to enter the nervous system efficiently, by exploiting the neuronal cell biology. While acute viral diseases come on quickly, chronic viral conditions have long incubation periods inside the body. Their symptoms develop slowly and follow a progressive, fatal course. Herpesviral encephalitis is encephalitis due to herpes simplex virus. 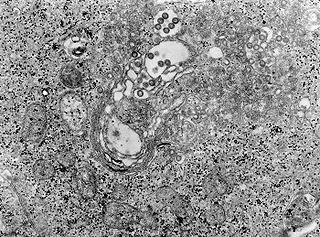 Langat virus (LGTV) is a virus of the genus Flavivirus. The virus was first isolated in Malaysia in 1956 from a hard tick of the Ixodes genus. This virus is antigenically related to Omsk hemorrhagic fever virus, Kyasanur forest disease virus, Alkhurma virus, Louping ill virus and other viruses of the tick-borne encephalitis virus (TBEV) complex. The Langat virus does not pose a significant epidemiological threat in comparison with TBEV. There are no known cases of human diseases associated with LGTV. The Malaysian strain is naturally attenuated and induces neutralizing antibodies to tick-borne encephalitis virus (TBEV) and protection against other TBEV complex viruses in animals. The stages of HIV infection are acute infection, latency and AIDS. Acute infection lasts for several weeks and may include symptoms such as fever, swollen lymph nodes, inflammation of the throat, rash, muscle pain, malaise, and mouth and esophageal sores. The latency stage involves few or no symptoms and can last anywhere from two weeks to twenty years or more, depending on the individual. AIDS, the final stage of HIV infection, is defined by low CD4+ T cell counts, various opportunistic infections, cancers and other conditions.